So you are ready to start selling on Amazon; The million dollar question is, what to sell on Amazon FBA? My name is Brock Johnson & I am going to show you how. What to sell on Amazon FBA is the absolute most important question to success on Amazon FBA! Unfortunately, despite the endless clickbait inspired titles you may see on the internet these days, there is no seven-step formula or five-minute solution, for finding the perfect product to sell on Amazon. Because ultimately you and I, as the sellers, don’t determine what to sell on Amazon, the over 300 million customers do. Our role is to simply analyze the demand from these customers, then supply them with a solution, in the form of products. Your success is going to depend on how well you are able to find these gaps in the market and fill them, relative to your competitors. With the right tools and strategies, you can make money and compete in any market on Amazon. But keep in mind, there is no specific set of criteria that will guarantee your success in every situation. Each market on Amazon is going to require a different level of skill, capital, and strategy. You’ll have to learn how to analyze and identify factors that are important to your specific needs. I was able to do $0-$6 million in 6 months on Amazon FBA. As you can imagine, this completely changed my life! I’m going to share with you, the factors that contributed to my success and why my product was successful. Before we can figure out what to sell on Amazon FBA? We need to first explore a few important factors. Do you have the RIGHT MINDSET FOR SUCCESS ON AMAZON? Before we dive into finding what to sell on Amazon FBA, it’s important for you to adopt the Amazon mindset. Having the right perspective is critical to your success. The journey to success on Amazon is not a linear path. You will have ups and downs, like anything else in life, the key is perseverance! Remember, for every 1 of the over 500 million products being sold on Amazon, somebody just like you is making money selling these items. Why not you? With the right mentality & tools, you too can take advantage of this life-changing opportunity! Amazon is not a fad, this is a generational mega trend that is here to stay. Just as the internet disrupted and decentralized information, Amazon is doing the same to commerce by democratizing barriers to entry. As you already know, traffic in this digital age is shifting from physical retail to the internet. But did you know Amazon is the biggest source of the internet’s road traffic? 55% of all searches now start on the Amazon search bar. So just as Google is for asking questions, Amazon has become the search bar for products. Global e-commerce is consistently growing at a rate of about 25% per year. 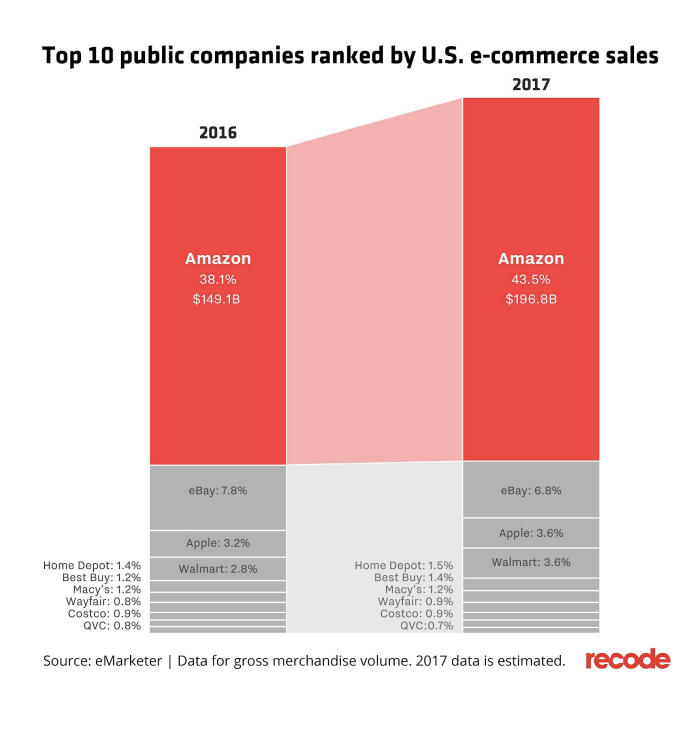 Amazon is taking up more percentage of this growth every year. Don’t expect this to slow up anytime soon! There has never been an opportunity like Amazon FBA! This golden opportunity won’t always be around. Over time, the different markets will become more saturated, which will make it harder to get into and profit. There is no better time than NOW to get started selling products on Amazon FBA! NOT YOU! But Statistically speaking, you are supposed to fail. 70% of sellers never even purchase one product. Which means only 3 out 10 TAKE ACTION, and move on from the product research phase. Of those three who move on, 90% stop selling after one-year. Like I said, NOT YOU! I failed at my first 7 products because I didn’t have the information I do now. My 8th product went on to do $6 million in sales in 6 months on Amazon FBA. That’s because I didn’t give up, I LEARNED from each experience and persevered. I’m going to teach you all the lessons I learned from my failures, so you can replicate my successes. I created the most comprehensive Amazon Course for people just like you. The best part is, I’m giving it away for only $1. ● They were just copycats who did not add value to the product and subsequently customers. ● They did not research hard enough or have the right information. ● They did not correctly do keyword research. ● They are stuck in ‘product paralysis’. Before selling products on Amazon, you should first understand, what makes a product successful on Amazon. WHAT MAKES A SUCCESSFUL PRODUCT TO SELL? ● Wholesale – Where you sell products on FBA that you purchase directly from manufacturers and distributors. Unlike Private labeling, you are not launching a new brand/product. You are essentially just a reseller. ● Retail & Online Arbitrage – Arbitrage is a business model where sellers purchase products from retail or online stores at a discount, then resell on Amazon at full price through FBA. Although it is very hard to scale, this model is often the easiest way to start on Amazon FBA. ● Private Label – Private labeling is the process of putting your own brand or label onto a product and selling them. This business model requires you to first come up with a product, then find a manufacturer to produce your product. Successfully executing this model is easier said than done. ● Dropshipping – Dropshipping is a business model with very low start-up cost and no inventory. A seller builds an e-commerce store and takes orders from customers. But instead of fulfilling the orders themselves they forward it to a vendor and the vendor ships directly to the customer. Some of these business models like drop-shipping and retail arbitrage are easier and require less initial capital to start. While other models such as Private Label, require more work but are also extremely more profitable. We are going to focus on Private Labeling; selling physical products on Amazon is the best opportunity in the world right now. Where else can you get a 340x ROI in just 6 months? I was able to do just that! Everything is a private label opportunity on Amazon FBA! Amazon’s private label business is expected to reach $25 billion in annual revenue by 2022. [ by SunTrust Robinson Humphre] You are only ONE successful product away from collecting your share of the pie. Differentiation – How can you add value & differentiate? This is one of the most important criteria for determining if you fail or succeed when sourcing a private label product on Amazon. ● Provide the customer with different colors & features. ● Present a more effective solution for the customer’s problem. ● Better marketing to the customer. Premium Quality – When private labeling any product, I suggest you have a premium product and brand. A big part of success on Amazon FBA is predicated on having the BEST PRODUCT. ● Perceived Value – People associate higher quality with higher prices, so if you bring to market a premium product, you are able to charge a lot higher. There is always a market for the rich. ● Good Reviews – Getting 4 and 5-star reviews on Amazon is very difficult. Having the best product is going to lead to more quality reviews than your competition. This, in turn, will lead to more sales and profit for you. ● Higher Margins – Having a quality premium product also leads to higher margins and ROI. This means more money for you because you are able to charge a higher price point. ● Customers – As you know, Amazon is the most customer-centric company in the world. Everything they do is to make and keep customers happy. Bringing quality products to market will make your customer happy and Amazon will reward you for it. Now that you have an idea of what to look for, here is how you find these products. HOW DO YOU FIND WHAT PRODUCTS TO SELL ON AMAZON FBA? Properly analyzing the market demand and correctly doing product research can make or break your Amazon career. How you discover the best items to sell on Amazon FBA is largely determined by a few factors. The most important being product research. All successful Amazon sellers know; it all comes down to product research. 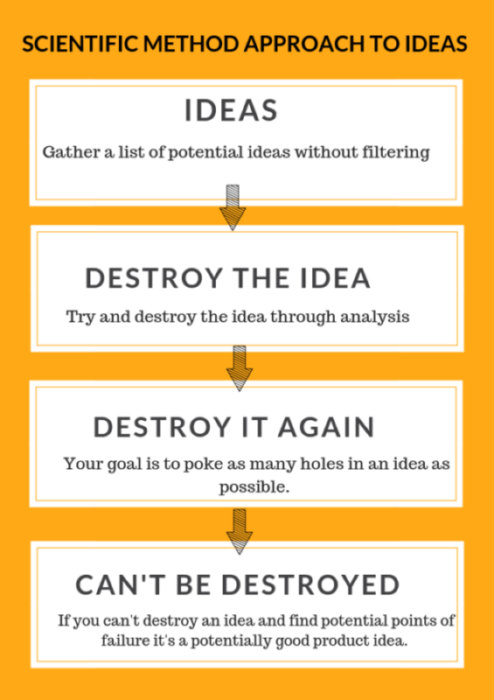 This is essentially the process of gathering ideas, then validating them through market analysis. Your success on Amazon is going to depend on your ability to gauge and capture the demand in these markets. PRODUCT RESEARCH – is the most important step of your Amazon career. Correctly doing research is where your success comes from. Doing product research wrong will make it very hard for you to succeed on Amazon. Luckily, there are tools like Viral Launch & Helium 10 that can help you with this. Two Steps of Product Research: Idea Gathering & Market Validation. The first step in product research is finding ideas for potential products. There are a few ways you can go about doing this. ● What’s already selling on Amazon? You can use the BSR or the Best Seller Rank to find out what products are selling more than others. The BSR ranks all the products in each category by sales rank, the best selling product being number 1. ● Everything is a private label opportunity! You can often get ideas from just your day to day life. What products are you wearing? Using? seeing? Get in the habit of looking up any and everything on Amazon. ● Use tools with Amazon’s data. There are tools like Viral Launch and Helium 10 which gives you data on Amazon sales for each product. You can search their database for potential products based on the set of criteria that fit your circumstance. Once you find a potential product idea, step two is to validate this idea by dissecting the market through analysis. One of the biggest mistakes you can make is to launch a product without first validating the market demand first. Everyone can compete in a market, but you can’t compete in every market. For example, to be successful in a large market will require a lot of capital. If you are just beginning on Amazon, a good strategy would be to start in a small market then scale up. Ultimately it’s up to you to find a market where you can succeed with your skills and resources. Barriers to Entry is an important factor to consider before deciding which markets are right for you to enter. ● Capital – do you have enough money or resources to compete in a given market? ● Size & Logistics – Some products are too big to ship affordably through FBA. ● Liability – is the risk of selling a certain product worth the potential reward? ● Seasonality – do you have the experience and ability to correctly forecast inventory and demand for a given season? Keyword Research – is fundamental to figuring out what to sale on Amazon FBA. On Amazon, your goal and mindset should be to capture the demand on the platform, not try and generate it. Therefore, finding the right keywords, with the highest search volume, is critical to your success. Keyword search volume – One of the biggest mistakes I see sellers make on Amazon is over-looking search volume. You can have the best product in the market but if nobody is searching for it, you will not make sales. The importance of finding the keywords with the highest search volume cannot be understated. Tools like Helium 10 and Viral Launch are enormously helpful in choosing the right keywords. They provide you with exact data directly from Amazon, taking the guesswork out of keyword research. In order to find the best selling products and opportunities on Amazon, you need to know what to look for. A variety of general factors can determine whether your product will succeed or fail. The biggest general indicator you need to be looking for is volume. There needs to be enough demand and a good amount of sales for a product or market to be worth your while. If there is no ‘dollar bills’ being spent and nobody is looking for a given product, how are they going to buy it? You can use tools like Viral Launch and Helium 10, which give you sales data for products directly from Amazon. No need for guessing or blindingly jumping into a market. Keep in mind, Amazon is the search engine for products, customers go to Amazon with the intention of purchasing products, not researching. This means they come to Amazon to find a product they already have an idea for. They have an idea in their minds for a product. They choose the best available option. You can’t invent or put words into customer’s minds on Amazon, that’s a recipe for failure. Therefore, we’re not looking to make brand new inventions, we’re searching through the demand already available on the platform. Our goal is to identify this demand and look for ways to make improvements to the products. Through improvements and added features – benefits, our goal is to position our product, as the best option for the customer. This is the approach I used when creating the solar eclipse goggles – which sold $6 million in only 6-month on Amazon FBA. With the goggles, I knew people needed a way to look at the sun and enjoy a once in a lifetime experience. I was able to start with this end-goal and work backward from there. I examined all the current problems I can solve in order to add value and fulfill the customer’s needs. For example, I was able to read the reviews in the market and saw that people weren’t having all their needs met. I took note of issues like, ‘light coming through the goggles” and “children couldn’t see the best” with the current options on the market. By reading competitor reviews and researching, I essentially came to the conclusion that customer’s wanted a more premium quality product in this market. I was able to meet their demands by making solar eclipse goggles that offered the premium quality people were searching for. So how was able to make these small improvements that customer’s wanted? It all comes down to the Analysis Framework. Every Amazon seller should understand and utilize this framework, it has the potential to determine if your products are going to make it or fail. Success on Amazon essentially boils down to meeting the customer’s needs. The FBA sellers who meet the needs of their customer’s the best will win out in the end. Although you don’t need to meet every single need, there are a couple of general ones everyone should aim for. It’s imperative that you find some ways to differentiate your product from the competitors in your market. If you are doing what every other FBA seller is doing, the only differentiation option for a product becomes price and reviews. Competition through price and reviews is not the game you want to play on Amazon. You will lose, especially beginners. To be successful, the game you want to play is finding ways to fulfill customer’s needs that currently are not being met. Time: Time sensitive situations can be a great opportunity on Amazon. For example, if the only options for products in a given market is merchant fulfilled or shipping it themselves, customers have to wait 5-7 days for these products to arrive. This can be an opportunity for you to leverage Amazon FBA and Prime to your advantage. If a product doesn’t have an FBA option, you can enter the market and have your customers get their products in 2-days or even overnight, through Amazon Prime. Ask yourself, how can I meet customer needs by making the products more convenient and/or more efficient? 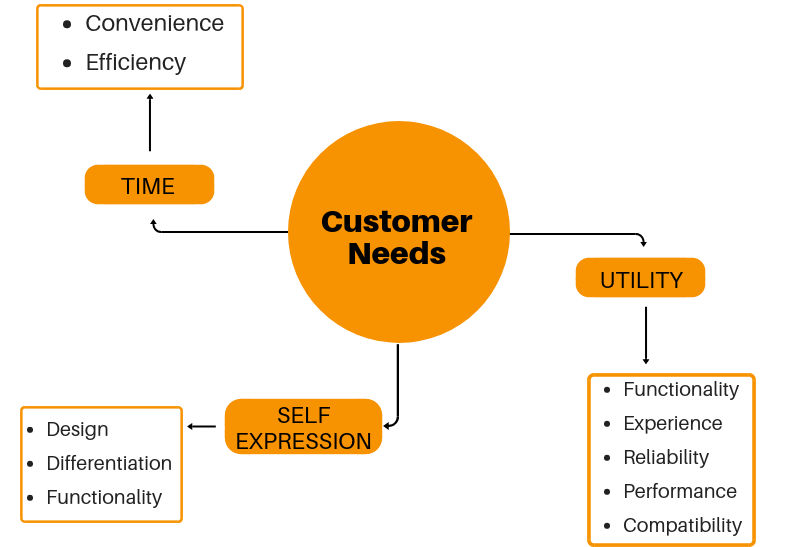 So what are customer needs? There are two types of needs: self-expression and utility. Utility: Utility can be defined as being useful or able to perform several functions in a way that meets customer needs. This can be to achieve something, improve upon, or simply providing adequate functionality. For example, the headphone market would fall under this umbrella. Customers are searching for headphones for its functionality and utility not as a means of self-expression. Functionality – can range from how the headphones fold, the softness of the ear cushions, or any added function that improves the utility of the product. Experience – How can you improve the overall experience of the customer? In the above example, the “sleek protective case” would be a good example. Reliability – How long will your product last? Is it quality? People are willing to pay more for products that are durable and last longer. Performance – How well does your product work when in action? In the headphone example, it could the battery life. Headphones that have longer battery life will do better relative to headphones that require frequent charges. Compatibility – How compatible is your product? For example, does the headphone work with IOS and Android devices? None of these factors are independent of each other, they all intertwine and affect one another. When determining how you can add value, I recommend reading through reviews to get an idea of what customers are searching for. What are they complaining about? Are they suggesting functions they wish the product had? What are they not happy about? The second way in which you can meet customer’s needs on Amazon is through self-expression. I suggest beginners take this route when first starting on Amazon FBA. With functionality, there only a handful of options of how you can differentiate your products. With headphones, for example, you’re limited to 4 or 5 things people really care about. With self-expression, the options are endless because what people like is all relative. When approaching the market through the self-expression lense, you can differentiate through design. If there are 7 different designs of let say an Alpaca shirt, there is no best answer per se. Because taste is a relative concept, everyone could choose something different. An example of when self-expression and design could be more important than functionality is wedding gifts. There is a lot of revenue in the wedding gifts market and if you examine the first page, you can see there are a lot of different items and designs. They are all different and making sales because design and self-expression are relative. As a beginner, you can come into a self-expression market and have an opportunity to succeed by making a different design than already available. Because of this, you can be positioned number 7 in this market and compete because the design is more important than functionality. Let’s also take a look at a market where utility is the only thing that is important. These are markets you don’t want to go after because you don’t have room to differentiate and stand out. In the fur gloves market, as seen below, you can see there aren’t many different options, they’re all intended to perform one simple function – remove fur from pets. Functionality – No way to differentiate, they all do the same exact thing. Experience – No different ways to remove fur using a glove, all the same experience. Reliability – They are all just about the same, maybe materials could differ but that’s still not a competitive advantage. Performance – They all perform just about the same, no way to really add to the experience. Compatibility – Compatible with any pet that has hair. In the pet gloves scenario, the market has decided that all customers want to do is remove fur from their pets. They are not looking to wear gloves for fashion purposes or anything, they just want something that can get the job done. You want to avoid constraining markets such this and look for places where there is an opportunity for you to add value; you can do so by going through the factors mentioned in this part. You can use this general framework to help you succeed when searching for what to sell on Amazon FBA. What to sell on Amazon FBA can be determined through a few different processes. 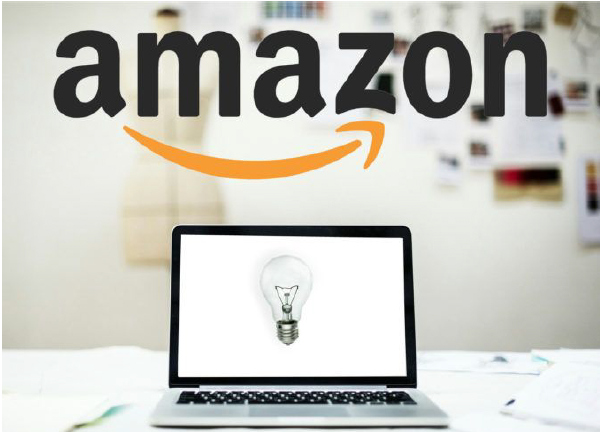 The first step to finding to profitable products you can sell on Amazon is to gather ideas. Your goal in the idea gathering phase is to come up with as many potential ideas as you can, without filtering or rejecting any of those ideas. Once you have a list of potential ideas, you must now validate those ideas using the scientific method as outlined below. The scientific method is essentially a procedure of systematically observing, measuring, and testing a given idea or hypothesis, to eventually come to an objective conclusion. This is the mindset and approach you need to use on Amazon, in order to greatly increase your chances of finding a successful product. You essentially start out with a bucket of ideas, from brainstorming or using research tools. Take those ideas and aim to destroy them through analysis. What I mean by destroying them, is to find failure points and reasons why the product would not work. Repeat this step again and search for different ways to destroy the idea. Remember the faster you get to failure is the faster you can learn and move on to finding what works. If your idea withstands the analysis, and you cannot think of a reason why it would not work, you might have a potentially good product opportunity. Our aim on Amazon and in business should always be to find opportunities, where we can add value and make a positive impact on the consumer, at the lowest risk possible. This means we are searching for low-risk ideas with a high potential upside. Once you have a good product idea, you can now use the product validation framework to evaluate your ideas further. The product idea validation framework is an important tool for Amazon FBA sellers, especially beginners. 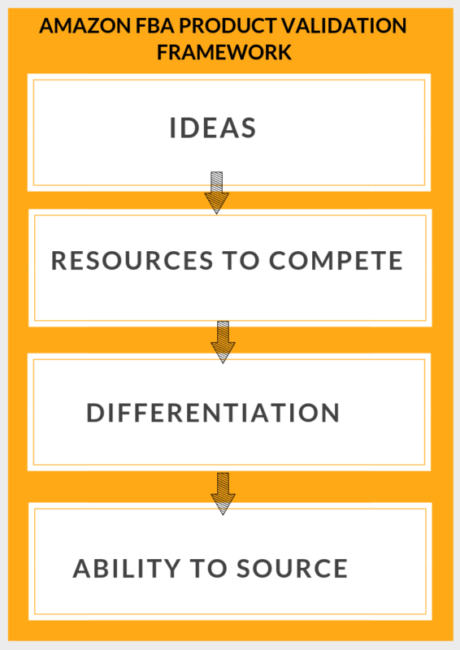 All of your product ideas should be put through this framework, so you can maximize your potential for success. Before starting the process of validating your idea, make sure there is enough money or sales for your product; as well as unfulfilled needs you can potentially satisfy with your product. Do you have the resources to compete in the market for your product? Do you have enough money? Enough experience and or knowledge? Find a way to differentiate your products from the competition. How can you stand out and give more value to the customers in your target market? Do you have the ability to source your product idea? Does the potential manufacturer have the capacity to turn your idea into a quality product? To find out how much money we would need to compete in the market for Bluetooth headphones, we would need to find the average revenue in the market. We can find this out by using sales estimator tools such as Viral Launch. We also need to figure out the average sales volume for the product, so we know how many we would need to source each month. We can find both of these data points using Viral Launch’s sales estimator- pictured below. 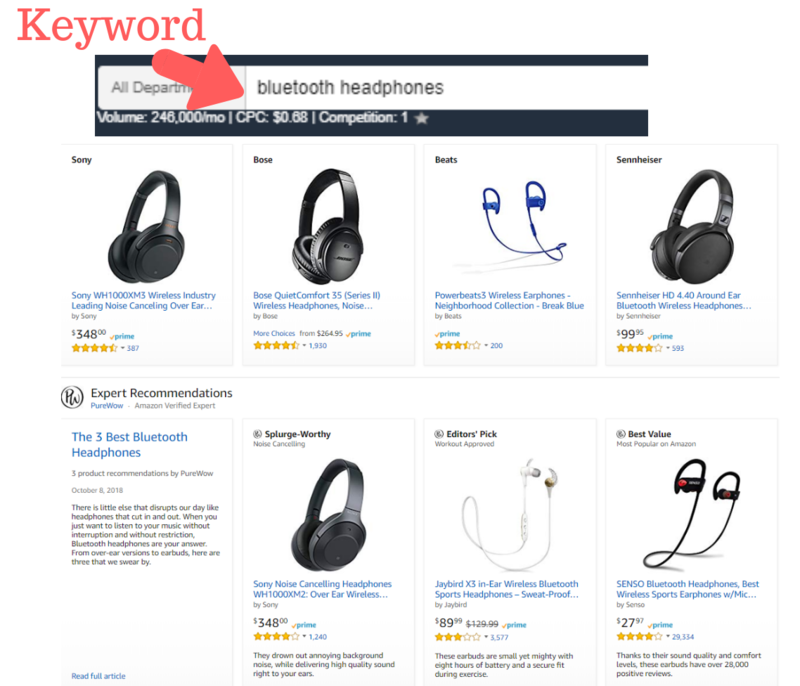 When you examine the rest of the headphones on the first page of Amazon, you find that every listing is doing at least $100,000 or more in revenue. These listings are also all doing at least 1,000 sales per month at a price point of $20-$30. Just given this basic set of data points, you can fairly easily tell that most people would not have the resources, specifically money, to compete in this market. We can validate this by going one step further. Next, let’s take a look at Alibaba (search engine for suppliers) to figure out how much money we would need to enter this market. 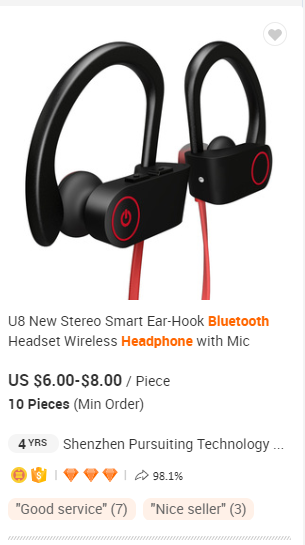 After going to Alibaba and searching for “Bluetooth headphones” I choose these ones to illustrate our example. Let’s say the headphones cost us $6 per unit. Keep in mind, you need to order about 2-3 month of inventory to stay in stock. This is in large part dependant on how long it takes the manufacturer to produce and ship your products. For our example, let’s go with 3-month just to be safe. We know from our previous step, we need at least 1,000 monthly sales to compete in this market on Amazon. Therefore, we would need to order 3,000 units or 3-month of inventory ($6 X 3000 units) for a total of $18,000 – before marketing and other associated costs. Once you’ve determined you have enough resources for a product, the next step is figuring out how you can stand out from the competition or differentiation. Instead of competing against everybody and going against the grain, differentiation allows us to simply stand next to the competition. When looking for a way to separate yourself and add value to the consumer, it’s important you approach this step with the customer in mind. As we mentioned, a product falls under utility or self-expression. How do I know the added benefit customers are looking for? Read your competitors reviews, what are they complaining about? This allows you to get out of your mind and instead make decisions based on exactly what the consumer is searching for. If you’re bringing to market a utility product, you must ask yourself, do people really want this added utility? Use data directly from consumers to answer this question. Self-expression is an easier process. You can simply figure out what people are buying by either sales volume or other metrics. Once you find out WHO is buying, you can then develop and tailor your products to fit their needs. The last step in validating your idea is to figure out if you have the ability to source the product. This step in the process is not as difficult as one might think. You have an idea for a product in your head, the question now is, does the supplier have the capacity or ability to bring your idea to reality? How can we make sure of this? Simply order a sample of the product and examine if they meet your standards. My advice to you, especially beginners; avoid sourcing products with regulations, that goes into someone’s body, or electrical outlets. Both from experience and common knowledge, these products are complex and come with a high risk. To summarize to this process; make sure you have the resources to compete in a given market. Find ways to differentiate and stand out from the heard. Add value to the customer by solving an unsolved need. Make sure you have the ability to source the product profitably. Find suppliers who can meet your standards and get the job done. Order samples to verify the level of product quality. Make sure there are demand and search volume for your product and that sales are distributed across the market. 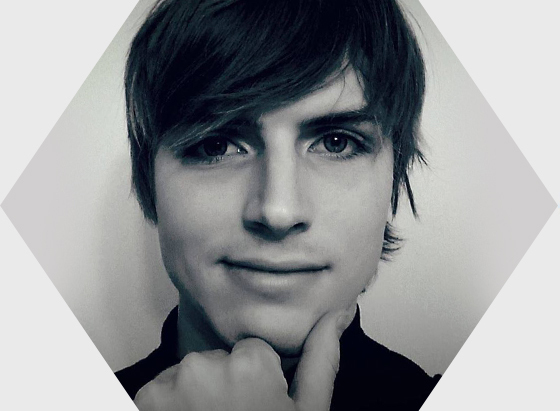 So, how was I able to do $6 million in sales in just 6 months on Amazon FBA? My journey to success was not overnight, I ‘failed’ on my first seven Amazon product launches. So why did I fail? Simply put, I did not have the information and tools I have now. Through trial and error, I learned from each failure and ultimately succeeded. I failed on those seven products because, at the time, I didn’t know how to validate demand, what tools to use. Therefore, I was simply guessing and taking action. Unfortunately, the customers were not searching for the products I was bringing to market, hence why they failed. I eventually learned an important factor for success on Amazon; You must learn to invent within what customers are searching for. I approached my 8th product with this mindset and forever changed my life! I put everything I learned, along with lessons from other 7-figure sellers into this $1 Amazon course. No UP-SELLS. NO PAID MASTERMIND GROUPS. NO BS. Just value in the form of 200+ videos, which took 8 months of work to create. My goal is not to give you a ‘fish’, but rather teach you ‘how to fish’ – in hopes that Amazon FBA may also change your life! Picking what to sell on Amazon is a critical first step in the process. Taking into account the different factors that make a product successful on Amazon is essential to finding a quality product. In order to find the right product to sell, you must listen to what the research is telling you and think logically. You can’t generate demand on Amazon, to be successful, you have to learn to capture the demand already on the platform. You do this by first gathering ideas for potential products. Then you validate these ideas through market analysis, by using tools like Viral Launch. Your goal is to find products and markets that you can compete in, with your specific level of resources and skill. There is no one-size fits all formula for finding successful products to sell on Amazon. Each market is going to require different skill and strategy when launching a product. If you have a QUALITY product, that adds value and is on a high converting sales listing, you will succeed on Amazon! I teach every step of this process in depth in this $1 Amazon Course.